This 1945 postcard, published for Hickey Brothers Cigar Stores, shows the beautiful new Art Deco style building on the corner of 16th Street and Third Avenue that was dedicated in 1941, as a home for City Hall and the Police Department. This corner had been the site of city government for decades, as the city first shared space with and later took over the three-story Armory building. In the 1930s, the city was awarded a PWA grant for $158,000 to build a new city hall – but lost it when matching funds could not be raised quickly enough. Undeterred by the setback, Mayor Robert P. Galbraith and others led a successful bond referendum that allowed the city to raise the $275,000 needed for a new building. 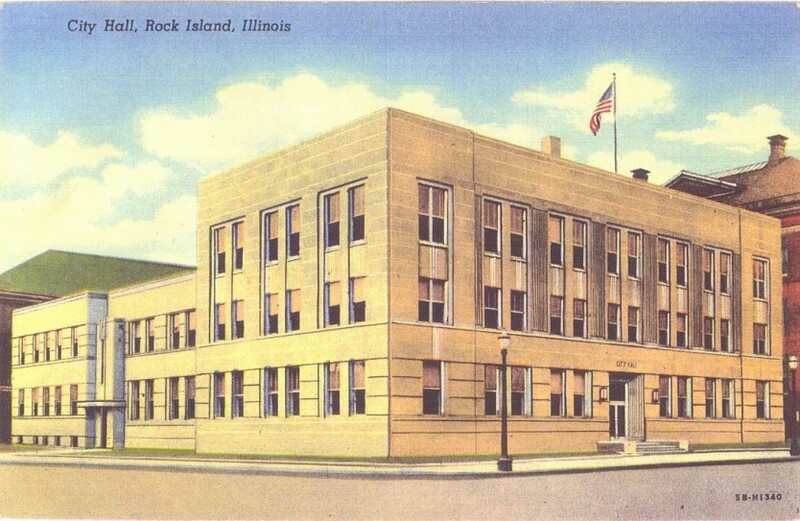 In 1938, William Stuhr, a partner in the Rock Island architectural firm of Cervin & Stuhr, was retained as designer. Stuhr offered several designs, some tailored to the various sites that were considered for the new building. A potential location on the Central Fire Station lot (17th Street just south of 5th Avenue) was rejected because it was thought that city offices should be in an office area, which meant right downtown. Another suggested location was Spencer Square, but the notion of destroying the square was met with a “storm of protest.” Finally it was decided to build in the same location, even though it meant city offices would have to move to temporary quarters during construction. Demolition of the old Armory and a smaller building to the west commenced in October 1939. Ninety two thousand of its bricks were cleaned and stacked so they could be reused inside the walls of the new building. Since finished rooms were proposed for the new basement level and the old Armory had only a slightly excavated lower level, it was necessary to remove 1800 cubic yards of material. This was more difficult than expected, as bedrock was found only 20 inches below ground level on the north side and 5 feet below surface on the alley side. This meant that the underlying bedrock had to be blasted before it could be removed. Luckily no damage to nearby buildings was reported during the blasting. When the cornerstone was laid on June 3, 1940, the building was already well underway, under the direction of general contractor T. S. Willis of Janesville, Wisconsin. Many local subcontractors were employed as well, providing materials and labor. The construction technique was called “protected steel” whereby structural steel columns and beams were covered with fireproofing material. The building was erected rapidly, with the first city council gathering in December of 1940 and the formal dedication on January 4, 1941. A special section of the Argus on that day provided detailed descriptions of its many features, most of which are unchanged today. The exterior of City Hall is buff Bedford limestone, which was reported to eventually weather to the light buff we see today. The front steps were made of blue Bedford limestone, chosen for its hardness as well as its color. In the interest of economy, the Police Department on 16th Street used a matching buff colored brick instead of limestone. The exterior is deceptively simple, with a horizontal emphasis on the first story, while the second and third stories display a vertical feeling. Non-structural detail is kept to a minimum with the main emphasis being placed on the entrances. The main doorway has heavily fluted curving walls, while the entry to the Police Department shows the fluted detail but on a less ornate scale. The fluting motif is continued on the areas between the second and third story windows. Notice the Art Deco styled incised lettering at both entrances. All of the exposed metal, including the window frames and sashes, is aluminum, a very Art Deco detail. Aluminum use continues on the interior, notably in the cast plaque on the west wall of the vestibule and in the clock on the lobby walls. The vestibule has verde (green) marble walls and an ornamental plaster ceiling. In the main lobby, the Art Deco theme is apparent in the curving walls and the “rift sawn” oak paneling. The magnificent terrazzo floor is a vivid demonstration of the durability of quality materials over time. It still looks like new. The first floor mayor’s office also had rift sawn oak, stained in two tones to match the oak furnishings, which included a green leather sofa and green carpeting. The third floor City Council chambers seated 128. The mayor sat at a rostrum, with the council facing him, rather than the spectators as they do today, from a semicircle just inside the railing. The columns and west wall of the council chambers were covered with a ribbon-grained mahogany “flexwood,” a thin flexible veneer glued to linen backing. There’s so much more to say about this building – and that’s without touching on the Police Department yet. But instead of repeating here what has already been printed, why not visit the library and read the Argus of January 4, 1941 to get the full story. Then walk over to City Hall and visit the public areas. You will be pleasantly surprised at how well our city has maintained the historic qualities of its home. It is a source of pride for our city. Many thanks to those responsible for its loving care over the past 70 years. This article by Diane Oestreich is slightly modified from the original, which appeared in the Rock Island Argus and Moline Dispatch on November 10, 2002.